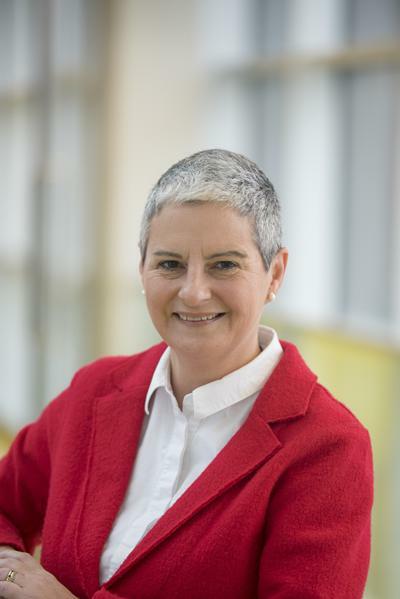 Professor Alison Richardson is Clinical Professor of Cancer Nursing and End of Life Care at the University of Southampton and University Hospital Southampton NHS Foundation Trust. In 2016, Alison was appointed Director of the Southampton Academy of Research and has been instrumental in our efforts to enable healthcare staff to build and sustain a research-related career. The Southampton Academy of Research (SoAR) works to ensure the education, training and career development of Southampton's research workforce, and works across the Faculty of Medicine, Faculty of Health Sciences and University Hospital Southampton. She holds a clinical academic appointment, which means she combines clinical practice and research. Her research focuses on understanding and responding to the needs of people affected by cancer and other life limiting illnesses. Working in the lung injury and critical care division of the NIHR Southampton Biomedical Research Centre, her multidisciplinary team works to continually develop and improve palliative and end of life care, identifying and addressing the issues patients, their families, healthcare professionals and organisations confront in the face of deteriorating health and critical illness. Understanding the experiences of patients and their families affected by cancer and other life limiting conditions is central to ensuring the care we deliver is fit for purpose. Appointed in September 2009 to joint clinical chair between the University of Southampton and Southampton General Hospital directed at achieving evidence-based cancer nursing care. Understanding the experiences of people affected by cancer, life limiting illness and who are at the end of life; Nurse-led interventions for issues and problems confronted by patients with cancer and their families (in particular cancer-related fatigue); the contribution of nurses to achieving effective, patient-centred cancer, palliative and end of life care; mixed method evaluations of cancer and palliative care services; the emotional well-being of cancer, palliative and end of life care workforce; multi-disciplinary teamwork in cancer care. We are working with Health Education England, the National Institute for Health Research (HEE/NIHR) and a number of other funders of Research Training Awards to determine the enablers and barriers to pursuing a research-related career amongst Healthcare Professionals (excluding doctors and dentists) using an Online Survey. This participant information sheet provides more details about the study. There are two objectives to this study. Firstly, the study is analysing free-text data from the national Cancer Patient Experience Survey (CPES) to explore the reported quality of life of patients with cancer of unknown primary (CUP). Secondly, we will compare the reported outcome measures of patients with CUP with patients who have metastatic cancer of a known primary. In this study we aim to explore and understand the links between patients' experiences of care, staff motivation, affect and well-being. Progress has been made towards the policy imperative of enabling patients to die in their preferred place of care. However, there has been to consideration of how this might apply in the context of those dying in critical care environments, including what those preferences might be, and practices to enable such preferences to be met. This study is an international collaboration with Australian colleagues at Peter MacCullum Cancer Centre in Melbourne. This study is testing the feasibility of a prospective, longitudinal matched control study to compare outcomes for patients with Cancer of Unknown Primary (CUP) and patients with metastatic cancer with known primary. Foster, R., Wagland, R., Symons, J., Davis, C., Boyland, L., Addington-Hall, J., & Richardson, A. (2013). An in-depth investigation of the experience of uncertainty in cancer of unknown primary. Psycho-Oncology, 22, 2. Coombs, M., Latter, S., & Richardson, A. (2012). Developing a clinical academic career pathway for nursing. British Journal of Nursing, 21(18), 1084-1090. Arantzamendi, M., Addington-Hall, J., Saracibar, M., & Richardson, A. (2012). Spanish nurses' preparedness to care for hospitalised terminally ill patients and their daily approach to caring. International Journal of Palliative Nursing, 18(12), 597-605. Davies, E., Madden, P., Coupland, V., Griffin, M., & Richardson, A. (2011). Comparing breast and lung cancer patients' experiences at a UK Cancer centre: implications for improving care and moves towards a person centred model of clinical practice. International Journal of Person Centred Medicine, 1(1), 177-189. Blows, E., de Blas Lop, J., Scanlon, K., Richardson, A., & Ream, E. (2011). Information and support for older women with breast cancer. Cancer Nursing Practice, 10(3), 31-37. Richardson, A., Griffin, M., Miller, C., & McNeil, I. (2008). Living life after cancer treatment: a nurse-led support service. Cancer Nursing Practice, 7(10), 36-38. Richardson, A., Menon, A., Johnson, J., & Ream, E. (2007). Developing competence: an evaluation of a nurse rotation pilot programme. Cancer Nursing Practice, 6(5), 35-39. Leary, A., Crouch, H., Lezard, A., Rawcliffe, C., Boden, L., & Richardson, A. (2007). Dimensions of clinical nurse specialist work in the UK. Nursing Standard, 23(15-17), 40-44. Molassiotis, A., Gibson, F., Kelly, D., Dabbour, R., Ahmad, A., Richardson, A., & Kearney, N. (2006). A systematic review of worldwide cancer nursing research: 1994 to 2003. Cancer Nursing, 29(6), 431-440. Thomas, V., Richardson, A., & Cansino-Malagon, A. (2006). Communication skills and cultural awareness in the field of cancer care. Cancer Nursing Practice, 5(8), 25-32. Ream, E., Gibson, F., Edwards, J., Seption, B., Mullhall, A., & Richardson, A. (2006). Experience of fatigue in adolescents living with cancer. Cancer Nursing, 29(4), 317-326. Richardson, A. (2006). Who will lead the way? Are we working together or falling apart? Cancer Nursing Practice, 5(10), 18-20. Gibson, F., Garnett, M., Richardson, A., Edwards, J., & Sepion, B. (2005). 'Heavy to carry': a survey of parent/caregiver and healthcare professionals' perceptions of cancer-related fatigue in children and young people. Cancer Nursing, 28(1), 27-35. Shipman, C., Addington-Hall, J., Richardson, A., Burt, J., Ream, E., & Beynon, T. (2005). Palliative care services in England: a survey of district nurses' views. British Journal of Community Nursing, 10(8), 381-386. Johnson, M., Menon, A., & Richardson, A. (2004). Establishing clinical rotation programmes in cancer and palliative care nursing. Cancer Nursing Practice, 3(1), 29-34. Cotterell, P., Sitzia, J., & Richardson, A. (2004). Evaluating partnerships with cancer patients. Practice Nursing, 15(9), 430-435. Sitzia, J., Cotterell, P., & Richardson, A. (2004). Research: involving patients in NHS cancer networks. PPI Monitor, Nov 2004, 8. Richardson, A., Ream, E., & Wilson-Barnett, J. (1998). Fatigue in patients receiving chemotherapy: patterns of change. Cancer Nursing, 21(1), 17-30. Richardson, A., & Ream, E. (1998). Recent progress in understanding cancer-related fatigue. International Journal of Palliative Nursing, 4(4), 192-198. Ramirez, A., Jamieson, L., Teasdale, E., & Richardson, A. (2009). The stress of professional caregivers. In G. Hanks, N. I. Cherney, N. A. Christakis, M. Fallon, S. Kaasa, & R. K. Portenoy (Eds. ), Oxford Textbook of Palliative Medicine. 4th Edition Edinburgh, UK: Oxford University Press (Churchill Livingstone). Richardson, A. (2004). A critical appraisal of the factors associated with fatigue. In J. Armes, M. Krishnasamy, & I. Higginson (Eds. ), Fatigue in Cancer (pp. 29-50). Oxford, UK: Oxford University Press. Richardson, A., Di Giulio, P., & Waddell, D. (2000). Nursing research in cancer care. In N. Kearney, A. Richardson, & P. Di Giulio (Eds. ), Cancer Nursing Practice: A Textbook for the Specialist Nurse (pp. 107-134). Edinburgh, UK: Elsevier Harcourt Brace. Richardson, A. (1997). Cancer pain and its management. In V. N. Thomas (Ed. ), Pain: Its Nature and Management (pp. 194-219). London, UK: Elsevier Balliere Tindall. Richardson, A. (1995). The pattern of fatigue in patients receiving chemotherapy. In A. Richardson, & J. Wilson-Barnett (Eds. ), Nursing Research in Cancer Care (pp. 225-245). London, UK: Scutari Press. Batehup, L., Corner, J., Porter, K., Simmonds, P., Lowson, E., Dodson, L., ... Richardson, A. (2014). Improving patient experience of cancer follow up: redesign and evaluation of adult cancer aftercare services for breast, colorectal, and testicular patients, at University Hospital Southampton NHS Foundation Trust. Poster session presented at The Changing Prospects for Cancer: New Models of Aftercare for Those Living with and Beyond Cancer, United Kingdom. Sitzia, J., Brown, V., Cotterell, P., & Richardson, A. (2006). Consumer involvement in cancer research networks: findings from a formative evaluation of the Consumer Research Panels pilot project. Paper presented at INVOLVE National Conference, United Kingdom. Coombs, M. A., Darlington, A-S., Long-Sutehall, T., & Richardson, A. (2014). An investigation about transferring patients in critical care home to die: experiences, attitudes, population characteristics and practice. Executive summary of final report. Southampton, GB: University of Southampton. Hunt, K. J., Shlomo, N., Richardson, A., & Addington-Hall, J. (2011). VOICES redesign and testing to inform a national end of life care survey. Southampton, GB: University of Southampton. Griffiths, P., Richardson, A., & Blackwell, R. (2009). Nurse sensitive outcomes and indicators in ambulatory chemotherapy. London, GB: National Nursing Research Unit. Brown, V., Cotterell, P., Sitzia, J., Richardson, A., Kelley, K., & Willers, R. (2006). Evaluation of a collaborative model for consumer research panels in cancer research networks. Macmillan Cancer Support. Sitzia, J., Cotterell, P., & Richardson, A. (2004). Formative evaluation of the cancer partnership project. London, GB: Macmillan Cancer Relief and the Department of Health.